The parish of Stalham is situated in north Norfolk. It lies northwest of Sutton, east of Smallburgh and Dilham, south of Brumstead and northeast of Barton Turf. The name Stalham may derive from the Old English meaning either ‘homestead by a pool’ or ‘homestead with a stables’. 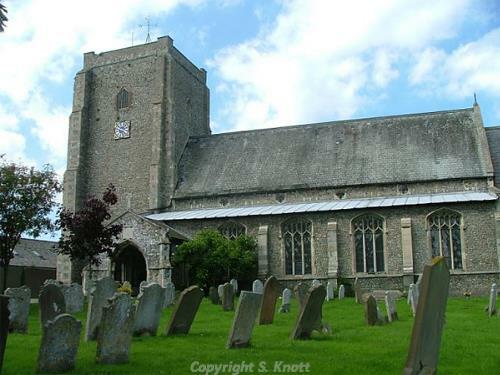 The parish has a long history and was well established by the time of the Norman Conquest. Its population, land ownership and productive resources were detailed in the Domesday Book of 1086. This document revealed that the parish was part of the land held by Count Alan, and that much of it was under the jurisdiction of Edric. It also demonstrates that Stalham had rich agricultural land and valuable woodland. The earliest occupation sites in the parish take the form of prehistoric pot boiler scatters (NHER 13074, 24821 and 33134). These pot boilers were for the heating of water for washing or cooking purposes and they have been found in various locations across Stalham. In addition to these sites, a large number of prehistoric flint implements have been recovered. Some of these finds may date to the Mesolithic period and these include a flaked axehead (NHER 24402), a blade core (NHER 25745) and an usual macehead or pebble hammer (NHER 8193). Many finds have been dated to the Neolithic period too, with the collection of finds containing objects like picks (NHER 8226), axeheads (e.g. NHER 8228), a fabricator (NHER 8284), a sickle (NHER 19830) and scrapers (NHER 25744). As we move into the Bronze Age the level of activity across the landscape increases. Aerial photographs have recorded cropmarks of several possible Bronze Age features including ring ditches (NHER 30407 and 36104), round barrows (NHER 8313 and 36107) and a possible roundhouse (NHER 49301). Several characteristic Bronze Age artefacts have also been recorded, namely palstaves (NHER 8231 and 14410), socketed axeheads (NHER 8230) and spearheads (NHER 8192). One slightly more unusual Bronze Age item to have been found is a rapier (NHER 8191). The Iron Age is less well represented in Stalham. Aerial photographs show several field systems that may have Iron Age origins (NHER 49307 and 49314). Iron Age finds are limited to pottery sherds (e.g. NHER 33134). A wealth of Roman archaeology has been recorded in Stalham. It has been suggested that Devil’s Ditch (NHER 7446), a horseshoe-shaped enclosure, was part of a military camp although it could be a natural feature. The cropmarks of a possible Roman farmstead (NHER 49302) have been identified to the northwest of Chapelfield Farm, and several enclosures (NHER 49307) and field boundaries (NHER 49310 and 49314) of possible Roman date have been recognised from other photographs. Such sites would suggest that the land in Stalham was fertile and suitable for farming during the Roman period. A Roman cremation has also been found near to Stalham churchyard (NHER 8240) and several urns containing burnt bone (NHER 8311) have also been reputedly recovered from ‘Bloody Field’. Other Roman finds tend to comprise coins (e.g. NHER 23727 and 35149) and pottery sherds (NHER 25019 and 33142), both of which have been found in large numbers across Stalham through metal detecting and fieldwalking. No Saxon sites have been located in Stalham. Nevertheless, a number of interesting objects and small finds have been discovered. First and foremost of these is part of a canoe that was dredged from the River Ant. This canoe (NHER 8310) was dated to AD 720 and is the oldest boat on record in Norfolk. A rather more grisly Saxon find to come from the river was the skull (NHER 8279) of an adult Saxon male! Other noteworthy finds include the blade and hilt of a Late Saxon sword (NHER 22340), a Late Saxon strap terminal with a stylised animal head (NHER 35011) and a Late Saxon bridle cheek piece with Ringerike-style decoration (NHER 37203). The most obvious medieval monument in Stalham is St Mary’s Church (NHER 8256). This building dates to the 14th/15th century, although the top of the original tower fell down and the chancel has been subject to rebuilding. Intriguingly, a fire engine house and lockup stand in the yard of the church. Documents also record that a medieval leper chapel once existed in the parish (NHER 8329) although little definitive proof has been found for its presence. A medieval carved plaque has been incorporated into Chapelfield Farmhouse (NHER 13198) and Stalham Hall (NHER 13197) is believed to be situated on the site of a former medieval manor but no complete medieval buildings remain in the parish other than the church. Aerial photographs show the cropmarks of various medieval to post medieval agricultural features like enclosures (NHER 11860), field boundaries (NHER 38438 and 38430), banks (NHER 38435 and 38439) and ditches (NHER 38435 and 38434). This information would tally with the evidence from the Domesday Book that suggested that by the medieval era Stalham was a thriving farming community. There is also evidence that peat cutting (NHER 49206) and turf cutting (NHER 49303) began to be conducted in this period, utilising the resources of Broad Fen amongst others (NHER 22944). Various pieces of medieval metalwork have been recovered by metal detecting. Noteworthy pieces comprise a seal matrix with a hooded falcon motif (NHER 8235), a gilt horse harness pendant (NHER 33135), an elaborate strap end (NHER 35855) and a lead ampulla that probably came from Walsingham (NHER 33135). All these items attest to religious, commercial, social and domestic activities in the parish. Allied to these finds are numerous pottery sherds and coins, which are the most common medieval finds. 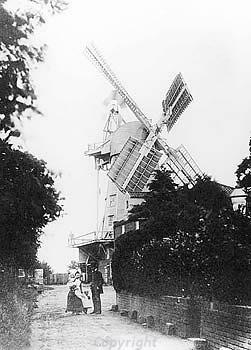 By the post medieval period a number of mills were operating in Stalham. Documentary evidence provides the location of ‘Marsh Mill’ drainage mill (NHER 8333) and an unnamed smock mill (NHER 13199) and a tower mill (NHER 15895). Rather more is known about Hunsett Mill (NHER 8336), which started life as drainage mill in 1698 before being replaced with a windmill in around 1860. At some time after this point the mill fell from use, and it was saved from dereliction in 1946. It now stands fully restored in the garden of the property here, and an electric pump nearby replaces the windmill. Milling was not the only industry present at this time. A brickworks (NHER 16974) opened in this period, was altered at some point prior to 1930 before undergoing major alterations in 1952. In 1981 the brickworks was removed after falling from use, with the site reverting to agriculture. Local rumours suggest that a series of tunnels linked the brickworks to the clay pit in Ingham parish. The Old Granary (NHER 30683) was also in operation as a wherry granary, with the river Staithe running underneath the building to form the wherry bays. The building dates to 1808 and is an excellent example of a rare industrial building. Again aerial photographs demonstrate the layout of agricultural field systems and enclosures (e.g. NHER 38432 and 38517). Of course, several residential properties were also built during this period, including Stalham Hall (NHER 13197). The Hall was built for Robert Puckle of Norwich in 1625-75 and restored in 1935-6. It was constructed in the Artisan Mannerist style using brick. The central porch has a sundial dated 1624, and all the windows are of a rustic Venetian style with original metalwork. Inside, there are original doors, a set of 17th century stairs with a dog gate and some 18th century panelling. Other houses worth a look are situated on the Old Yarmouth Road and comprise Stewards House (NHER 46690), Walnut Cottage (NHER 47371) and The Homestead (NHER 47527). The last two in particular are pleasant 18th century properties with thatched roofs and timber features. The most unusual post medieval discovery to be made in Stalham is that of an elephant skeleton beneath a tree on the lawn of Stalham Surgery (NHER 28991). The tree was said to be 150 years old and the owners of the property in the mid 19th century are known to have kept a circus! Other more interesting finds consist of a coin weight of George I (NHER 23726), lead musket balls (NHER 33141) and a mould used to produce musket balls (NHER 8311). The most recent archaeological records for Stalham relate to World War One and World War Two structures. A circular pillbox dating to World War One stands on the northeast side of Wayford Bridge (NHER 7447). RAF thermal images also show the cropmarks of three ring ditches northeast of Stalham Green which could indicate the former presence of a World War Two searchlight battery (NHER 30407). The base of a World War Two Spigot mortar has also been identified on a footpath to the east of the bypass (NHER 34306). During World War Two the stump of one of the former mills (NHER 15895) was given a concrete roof so as to allow it to function as an air raid shelter. Lastly it is worth noting that the North Walsham to Dilham canal, which passes through Stalham, was used as an anti-tank ditch in World War Two (NHER 49211). Thomas Sunley (NLA) 3 July 2007. Knott, S., 2006. ‘St Mary’s, Stalham’. Available: http://www.norfolkchurches.co.uk/stalham/stalham.htm.